Bob Marley's 'Legend' Album Finally Cracks Billboard Top 10 : The Two-Way While the 30-year-old album has sold millions of copies over the years, it only reached No. 54 when it was released. The new spike comes courtesy of a steep price cut. 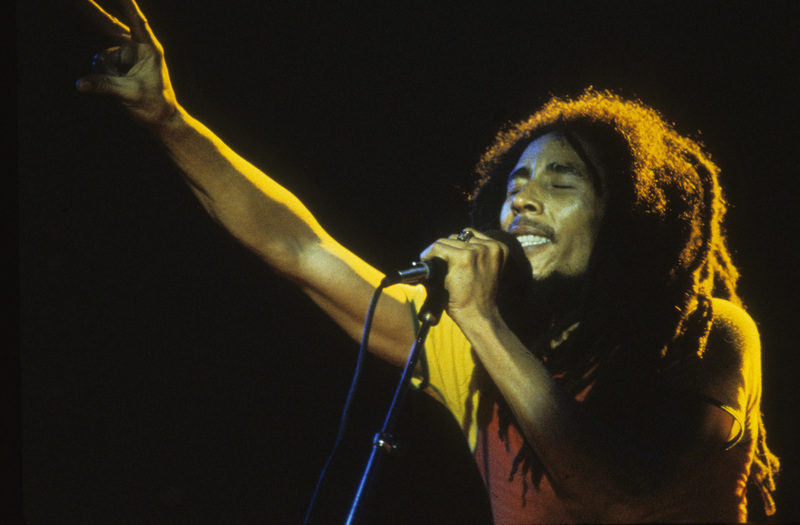 Bob Marley, seen here performing in Paris in 1980, died years before Legend was released. It has since sold millions of copies — and this week, it hit No. 5 on the Billboard chart. Billboard's album sales chart has a new entry in its No. 5 spot: Legend, the greatest hits record by Bob Marley and the Wailers. It's the highest spot ever for Marley. And while the 30-year-old album has sold millions of copies over the years, it only reached No. 54 when it was released. The new rise of Legend is tied to a special price cut. Billboard reports that sales of the album rose more than 1,000 percent after music service Google Play slashed the price from around $9 to 99 cents. On the new Billboard 200 chart, Legend is wedged between Ariana Grande and Counting Crows — starkly different company from its debut in 1984, when albums by Michael Jackson (Thriller) and Prince (Purple Rain) dominated the No. 1 spot. "We love to celebrate artists like Bob Marley whose music is timeless and beloved," Google Play's Gwen Shen tells Billboard. "Our hope is that this promotion ... will introduce his music to the next generation of fans and continue his legacy." "Billboard and Nielsen SoundScan usually haven't counted sales tallied by digital music retailers' massive price reductions or giveaways, like when Google Play allowed people to download Katy Perry's Prism for free. After Lady Gaga offered Born This Way as a $1 download in the Amazon Marketplace in an attempt to sell a million copies in its first week of release, Billboard and Nielsen put rules in place to disqualify that type of sales manipulation from the charts. However, Google Play's Legend pricing skirts those bylaws thanks to the album being a 30-year-old "catalog" release." While the 99-cent price brought a rush of interest, Legend has been doing pretty well in sales, with at least 15 million copies sold since it was released in 1984, Billboard says. A few thousand are still sold each week. Marley died in 1981. His work with the Wailers was mentioned in NPR Music's discussion of "the albums everyone loves," with the 1977 record Exodus mentioned as a highlight. But it was 1976's Rastaman Vibration that had previously been Marley and the Wailers' highest-charting album, at No. 8. As NPR reported in June, while its membership has shifted over the years, the Wailers visited the U.S. this summer to play a tour celebrating Legend's anniversary.